With fall weather comes lots of baking – whether it’s pies for Halloween and Thanksgiving or different baked goods for bake sales, fundraisers, or pot lucks. Now most people know how to bake a pie. But maybe you want to bring something else to the pot luck, so your apple pie doesn’t get lost amidst a sea of other apple pies. Fortunately, Lucky Leaf has a wonderful collection of recipes that will allow you to bake up a unique and delicious treat that is perfect for everyone! Remember that in some of our previous reviews of Lucky Leaf, we demonstrated how it could be used in a cake (or on a cake.) The following recipes continue that trend of showing that Lucky Leaf Premium Pie Filling is actually more than just a pie filling. This recipe is SUPER easy. There are only 4 ingredients – gingerbread mix, Lucky Leaf Premium Apple Pie Filling, caramel topping and whipped dessert topping. Mix the gingerbread mix and pie filling together, bake it, then top it with the rest. The final product tasted liked something that gets served for dessert at a fine dining restaurant. 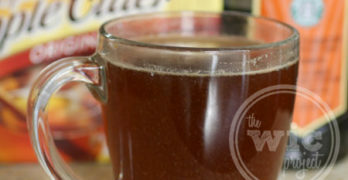 The gingerbread was moist and the apples added a great variation to the traditional gingerbread flavor – bringing another hint of sweetness that blended nicely with the gingerbread spice. I think the apples also made this extra moist ensuring that every bite was perfect. (Notice the big chunks of apples peeking out from inside the gingerbread.) If you use an 8×8 pan instead of a 9×9 pan (like I did) then you will need to add 10-15 minutes of extra baking time. This was my very first time baking a cheesecake. I even bought a springform pan so I could make this recipe properly. From the foundation of the brownie crust, I just knew that this would taste delicious. I mean cherries and chocolate? That’s a killer combo right there. Then add in the richness of the cream cheese, top it with whip cream, and it’s ALL over. Sadly, my springform pan did leak (boo) but fortunately, a quick wrap of aluminum foil and we were off to the cheesecake races. 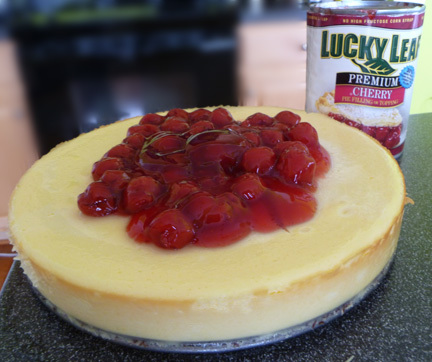 The Lucky Leaf recipe uses the Lucky Leaf Premium Cherry Pie Filling to create a hidden stash of cherries in the middle of the cheesecake and then tops it off with the cherries as well. 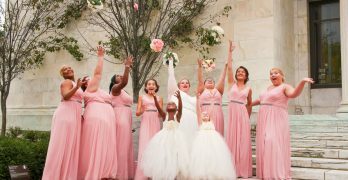 Could it have gotten any better? I dunno. I’m pretty proud of this cheesecake, if I do say so myself. 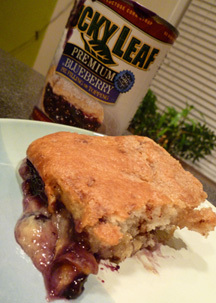 It’s no surprise to me that this was the winning recipe of the Lucky Leaf Blue Ribbon Recipe Challenge. It uses on can of Lucky Leaf Premium Blueberry Pie Filling, along with cinnamon streusel quick bread mix, cream cheese, and vanilla pudding to create an amazingly delicious blueberry layered delight. I used the one dish method of baking, starting with the pie filling for the bottom layer, topped with the vanilla pudding mix, and finally topped with the streusel mix. Bake it up and you have a warm and tasty dish that has the sweetness of the blueberries blending perfectly with the pudding and the cinnamon. I actually froze several pieces of this recipe so I could enjoy them in the upcoming months. 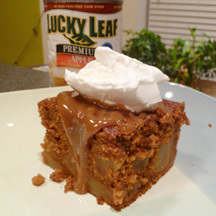 So remember, the next time you have an extra can of Lucky Leaf, check out their website to see what other treats you can bake up with their Premium Pie Filling. The recipes for all of these yummy desserts can be found below. We will also be posting them here in the upcoming weeks.